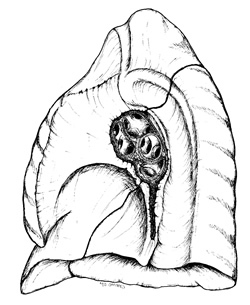 Rises above 1st rib anteriorly but is below the posterior aspect of this rib. Left lung overlies stomach, liver and spleen. mediastinal - hilus and cardiac impression. 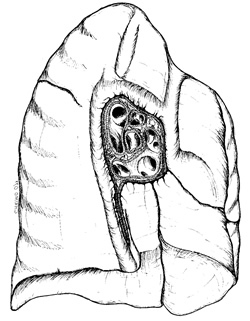 Lower borders of lung related to 6th, 8th and 10th ribs. Completely cuts through costal, diaphragmatic and mediastinal surfaces as far as the root it then follows line of the 6th rib from 4th thoracic vertebrae to the 5th intercostals space anteriorly. 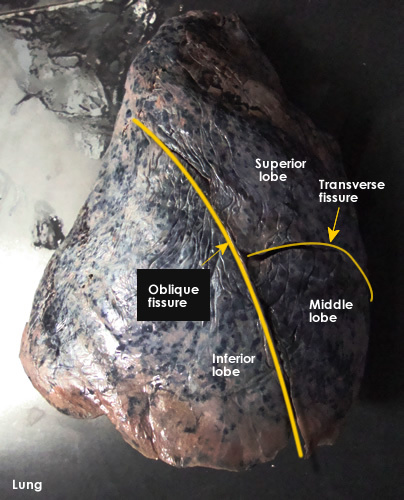 Meets the oblique fissure at the mid-axillary line.